The most remarkable aspect of this book is the level of sincere and heartfelt praise the authors of the 17 essays contained in this volume have for Bernard S. Bachrach. Many of the essays begin with gushing praise even where there is sometimes disagreement, such as the following statements: “A Festschrift is an occasion to reflect upon the scholarly achievements and influence of a scholar. In my three-decades-long friendship with Bernie Bachrach, we have sometimes disagreed about historical interpretation (48- Richard Abels),” “This article recognizes the central role of medieval France in the research of Bernard Bachrach, whose friendship I am very happy to have enjoyed since we first met in Berkeley in 1965, and whose self-assurance, scholarship, and indefatigable industry continue to evoke my awe (79- Walter Goffart),” and “Long before I knew anything about Bernie the scholar, I just knew him as my dad. My intellectual debts to him are incalculable, but far more important has been the forty odd years of a father’s love. So, this one is for you Dad (273- David Bachrach).” This warm praise provides a human touch to research that is performed at the highest level. At the beginning of this book, the complete bibliography of Dr. Bachrach is listed, and it fills about twelve pages of articles and monographs on a staggering variety of subjects ranging from child abuse in early Medieval Europe to examinations on the practical use of the De Re Militari during the early Middle Ages to book-length treatments on an obscure Angevin bureaucrat. He is perhaps best known for his writings on the Carloginian imitatio imperii in matters of statecraft and warfare . It is therefore little surprise that this collection of essays should have a wide scope of subjects that expands upon subjects in Bachrach’s substantial oeuvre, including essays on the Roman frontier along the Danube in late antiquity, reflections on the military and political genius of Alfred the Great and Conrad II, the logistics of the siege of Acre, the place and context of women in Romanesque combat scenes in the churches of France and Spain, a short biography of an obscure Plantagenet bureaucrat, and the implications of a neglected text for the Battle of Crècy that would place the battle in a different location than is currently thought to be the case. The essays are, as might be imagined, full of close attention to primary documents, argue passionately and intellectually for changes in current interpretations of various historical matters, and show the strong influence of Bachrach in style, approach, and research interests. If imitation is the sincerest form of flattery, this volume offers very sincere and erudite flattery. Even though the subject matter of the essays is extremely varied, there are common elements to them that show a consistency of approach in the various authors and in Dr. Bachrach himself. One of these common elements is a commitment to exhaustively examining source material. Over and over again the essays in this volume show a dedication to finding and analyzing source material. Whether one is reading about French historical maps in the 19th century and before, or the accounts of the forgotten but important Battle of Bouvines in 1214, or the Acta of Merovingian Church Councils, texts are at the core of historical interpretation. Both the existence and the proper understanding of what a text, or a group of texts, says, makes a huge difference on the possibilities and likelihood of understanding the past accurately based on the best available evidence. Similarly, many of the essays show an attention to political and logistical matters that are all too often neglected, including the difficulties of coalition warfare and feeding armies during sieges. The authors are also interested in the way that institutions in church and state served to depersonalize leadership and create a context for transmitting the culture of warfare and power without a constant need to depend on charismatic leaders personally micromanaging every decision. By showing attention to the often-neglected details of Medieval warfare, they raise it to a level of much more serious scholarship than has often been the case. A book like this, written in honor of a specific historian whose writings have been important in military history, will be most interesting to students of Medieval Military History. That said, these essays are broad enough to interest readers who are interested in battle studies, religious history, art history, the relationship between war and society, or those who enjoy biographical sketches of notable and important historical personages. The broader one’s appreciation of Medieval history, the more one will find of interest here. Likewise, those who are familiar with and fond of Bachrach’s approach to history and his belief in the continuity between antiquity and the Middle Ages are likely to find this book immensely appealing as well. One of the essays even takes a look at a familiar problem, namely the reason for the delay of William the Conqueror’s invasion of England, making a persuasive case for a belief that it really was the rough seas that prevented the crossing of his army and not a deliberate strategic move on William’s part. 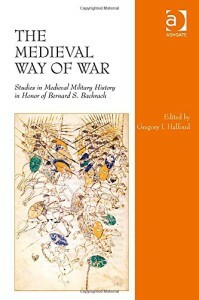 This book is particularly worthy as a scholarly reference for the military history of the Middle Ages, giving a one-volume sample of a broad variety of subjects that deserves a place on library shelves, or on personal bookshelves of researchers who want to appreciate the legacy of excellent research that Bachrach has encouraged through his life and work. Bernard S. Bachrach, Charlemagne’s Early Campaigns (768-777), History of Warfare 82 (Leiden: Brill 2013), 768pp. $297.00. ISBN 978-90-04-22410-0. This entry was posted in BookReview, Uncategorized. Bookmark the permalink.